When it comes to grilling, Korean chefs really know what they’re doing. Bright, umami-packed flavors, perfectly marinated meat, super-hot charcoal fires—Korean barbecue is a delicious art. Learn how to master it with these fantastic recipes. This succulent recipe is based on bulgogi, a classic Korean dish of sliced beef that’s marinated in soy sauce, sugar, sesame oil and garlic, then grilled. Chef Roi Choi is a connoisseur of Korean barbecue. 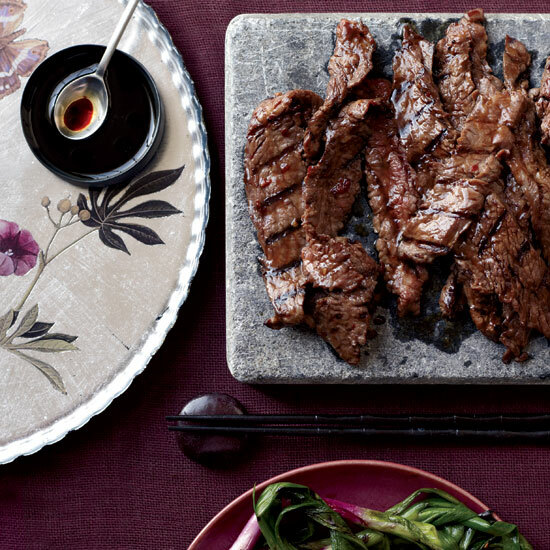 He loves these thinly sliced short ribs, known as kalbi in Korea, which are marinated overnight in a garlic, soy and sugar mixture, then quickly grilled. In Korea, this recipe, known as toejigogi kui, is made with pork belly, but it’s equally delicious—and much leaner—when prepared with pork loin. Salty-sweet, sticky and delectably charred, these chicken thighs get their intense flavor from miso, chile powder, fish sauce, sesame oil and ginger. Chef Stephanie Izard’s Korean beef kalbi ribs are a summer mainstay. The longer these meaty mushrooms marinade, the better. We especially love this recipe because the ribs are cut across the bone and cook for only 10 minutes. They taste just like juicy seared steak, but they’re more fun to eat. This dish is great for people trying to cut down on carbohydrates, because the meat is wrapped in lettuce instead of served on bread or in a tortilla.